Teaching tennis to little tikes is so cool. We still can’t believe it’s our job! We bring a little fun, a dash of patience, and a ton of positive energy to schools around the country! Our pint-sized tennis stars deserve nothing less! A seasoned entrepreneur and a lover of tennis, Greg is responsible for the vision and overall direction of the company. When he’s not envisioning and directing, Greg can be found at the local tennis club watching his son, Dylan (the original Tennis Kid), tear it up on the court against kids almost twice his age! As the company’s founder and original instructor, Jeff brings his passion for tennis and awesome teaching techniques to help guide our instructors and shape our overall curriculum. When “Coach Jeff” is not hard at work, he can be found having fun with his 2 incredible daughters. 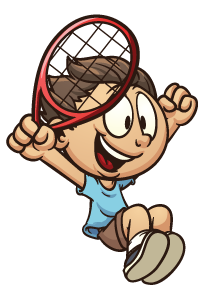 As the person responsible for selling our program to schools around the country, Ben has the most fun of anyone at TennisKids. He says he works hard, but how hard is it really to convince schools to offer our tennis program on campus! When he’s not busy selling tennis, Ben spends most of his time playing tennis and hanging out with his beautiful family.